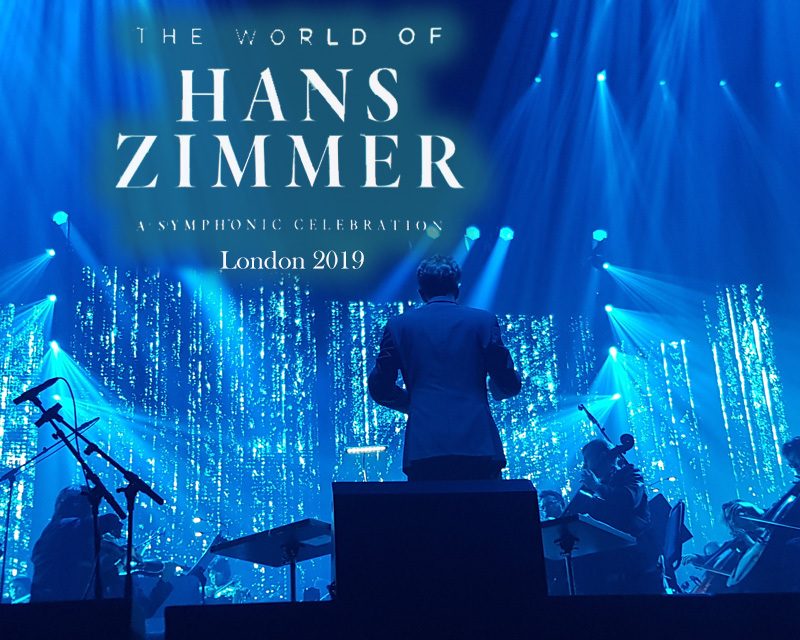 On Saturday, March 23, the tour ‘The World of Hans Zimmer – A Symphonic Celebration’ performed in London, and Stella Lungu, who attended the concert, tells us her impressions about the show in this article for SoundTrackFest. 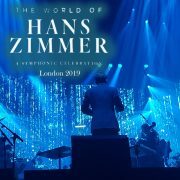 People from around the world traveled to London on Saturday to revel in Hans Zimmer’s legendary cinematic masterpieces. 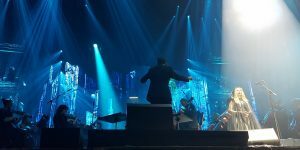 Part of the The World of Hans Zimmer – A Symphonic Celebration tour, the concert took place at the SSE Arena in Wembley, which boasted a full house of enthusiastic fans. 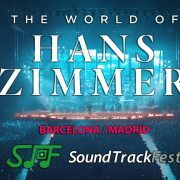 Zimmer is one of the very first composers to take the wondrous world of film music out of the cinema and bestow it to the masses, thus propelling his name into the ranks of celebrity rock bands and pop stars. 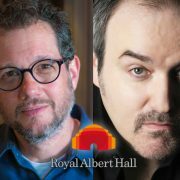 Shining a bright light on the power and timeless beauty of film music, Zimmer demonstrated time and again during his long career that a film score is not necessarily a mere tool that supports a director’s vision, but an art form in its own right, which does not require visual reinforcement. 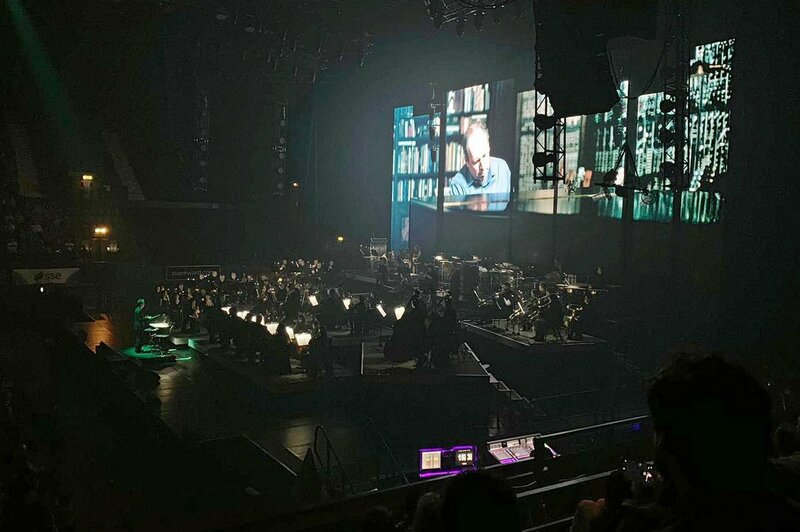 Even though the composer wasn’t in attendance himself, one could feel the love and reverence abounding in the venue every time he would make an appearance on the screen behind the orchestra. 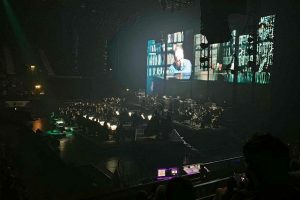 The composer pre-recorded a few messages and interviews with a number of his long-time collaborators in his studio in Santa Monica which were projected onto the screen in between performances. 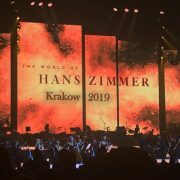 Ever the humorous and down-to-earth fellow, Zimmer reminisced of various experiences during past collaborations while chatting with the likes of Ron Howard, Nancy Meyers and Lebo M.
The concert featured never-before-heard symphonic arrangements of some of Zimmer’s much-loved pieces. The composer spent months transforming his legendary themes into grand concert suites, and the rich arrangements bear testimony to his hard work. 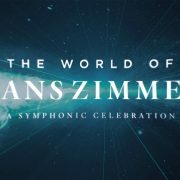 The performance commenced en-force with a reimagined version of The Dark Knight, building up tension by means of Zimmer’s powerful signature percussion. 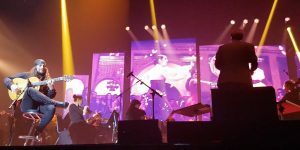 The strings were briefly caressed by drifting guitar riffs, which were then met by the recognizable and bold brass section. Having built up momentum and excitement, the programme then proceeded with the marching rhythms of King Arthur. 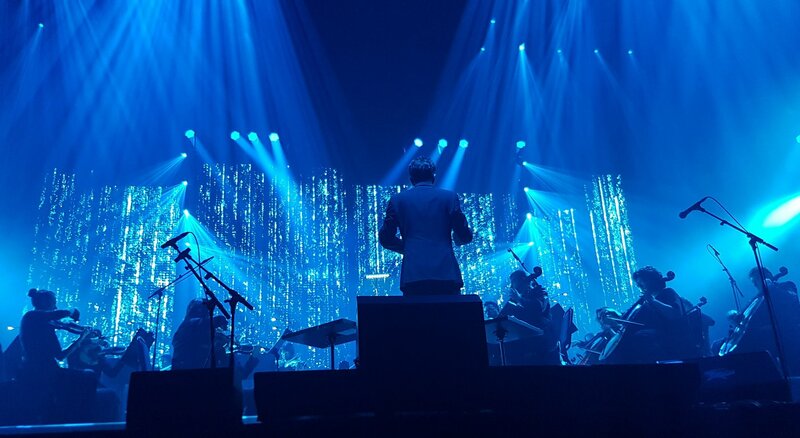 In contrast to the “Hans Zimmer Live” tour, which featured abstract visuals, the audience was able to enjoy projections of film scenes that accompanied the music. The sequences were hand-picked by Zimmer himself and represent scenes that were important to him. As soon as the orchestra and choir finished performing the King Arthur Orchestra Suite, Zimmer made his first appearance on the screen saying a few words about the tour and introducing his old friend, Gavin Greenaway, who is the conductor leading the Symphony Orchestra of the Bolshoi Theatre, Belarus on this tour. The romantic solo guitar notes were introduced by the dexterous fingers of Amir John Haddad, who is the extraordinaire guitarist of this tour. 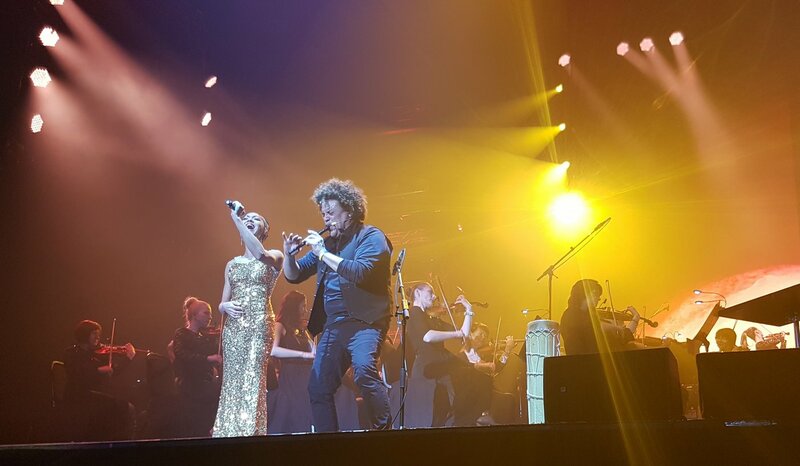 Under the masterly direction of Gavin Greenaway’s baton, the musicians were then guided into a passionate orchestral flamenco that drenched the arena in Spanish joie de vivre. A most gracious Lisa Gerrard made her appearance for the second half of the suite, enshrouding the venue with her distinct dark operatic timbre. The Pearl Harbour suite took the audience on a 5-minute melancholic journey, only to be contrasted by a somber suite for Rush. The first half of the show ended with a 20-minute long orchestral suite of The Da Vinci Code. Following a brief appearance on screen together with Ron Howard, Zimmer disclosed that he decided to share his version of The Da Vinci Code with the world. Referring to the piece as his ‘whole sketchbook’, he claims that this was the way he had thought of the story, which is not linear to the script, but does have all his experiments in it. The suite was divided in four parts, soprano Katharina Melnikova opening the first piece with her angelic voice. 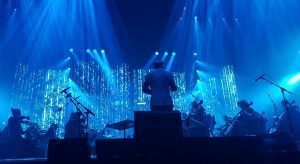 A myriad of blue lights revealed the choir which had remained hidden behind the orchestra on a tall scaffolding until then. The first two parts had a liturgical and familiar, yet somehow otherworldly character to them, suggestive of a Judgement Day trial. Part three started with a more melancholic feel to it, led by Rusanda Panfili on violin and Marie Spaemann on cello. The fourth and last piece was a slightly-altered version of Chevaliers De Sangreal, ending part one of the show. Following a 20-minute long intermission, the programme continued on a cheerful and uplifting tone with an orchestra version of Madagascar’s ‘Best Friends’, the suite from Spirit, an orchestra version of ‘Oogway Ascends’ from Kung Fu Panda, as well as an orchestral suite for The Holiday. 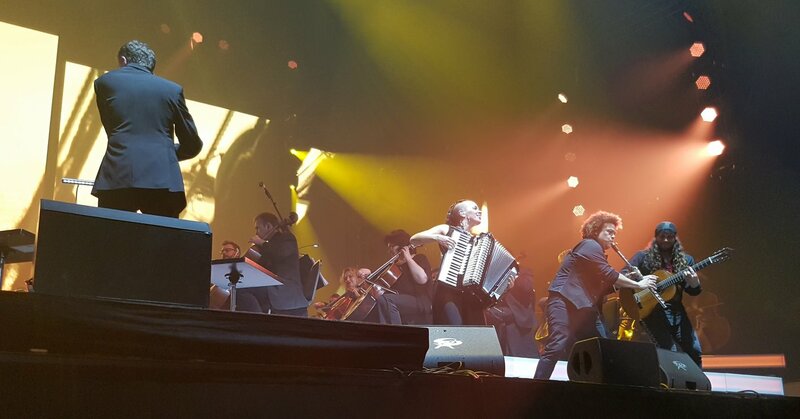 To stay in tune with the concert’s tendency to take the audience on an emotional rollercoaster, the arena suddenly turned scarlet red and Marie Spaemann began performing the theme from Hannibal on cello. The love theme, which was originally written for 28 celli, is recounting the ill-fated love story between Hannibal Lecter and Clarice Starling. The programme then proceeded with a suite from The Lion King. According to the composer, the 9-minute composition contained the pieces he wrote about his own experience, which was his father dying when we was very young, and that is what the film was all about for Zimmer. Consequently, it had become a requiem to his father. The piece starts with ‘We Are All Connected,’ journeys through ‘Stampede’ and ‘Mufasa Dies,’ then culminates with Circle of Life. To the sheer delight of the audience, Lisa Gerrard appeared on stage to sing her iconic pieces in the 3-part suite for Gladiator. 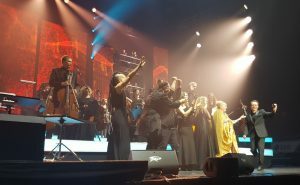 She was joined on stage by singer and composer Asja Kadrić for the last part titled ‘We Are Free’. I think it’s safe to say that by the time the two singers finished their performance, every single person in the audience had goosebumps. ‘Time’ from Inception was of course a nice touch. 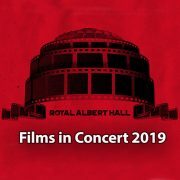 And because no one could hope to replace Zimmer on stage to play his piano, a recording of the composer was projected upon the screen, with the camera rotating around him as he played the tune. 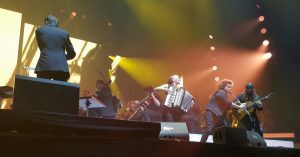 The concert concluded with Pirates of the Caribbean, which saw everyone at the front of stage showcasing their instrumental prowess: Eliane Correa on accordion, Amir John Haddad on guitar, Rusanda Panfili on violin, Marie Spaemann on cello and of course, the one and only Pedro Eustache on flute. 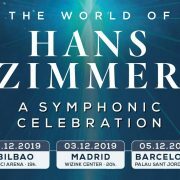 With its rich orchestral arrangements, carefully-curated film sequences and visuals, stellar musicians, and splendid conductor, The World of Hans Zimmer is a delightful symphonic experience in its own right that is not to be missed. Stella is a Creative Director and aspiring composer based in London, UK. 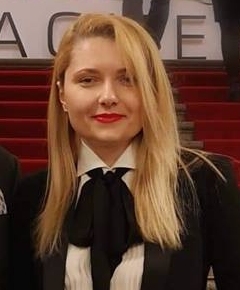 Originally from Chișinău, Moldova, she was a digital nomad for years, before falling in love with London, settling in and starting her own business. She is also a student at Berklee College of Music where she studies music composition for film, TV and games.